This is the opening page in the scrapbook that I'm doing about my daughters first pregnancy. The photo was taken of her making her first OB appointment after the HPT was positive. Lots of things going on here. I made a window in foam core that was about 2/3 the size of the layout. Then I "pleated" some patterned paper. This was used as the background for the photo "window" and detail between layers. The photo was mounted on cardstock then laid on top of the pleated paper using pop dots. The top sheet of paper was torn to create a window for the photo and also to define the upper layerand I chalked the edges. Then I made some tags and paper pieced the 3 bears and added buttons for embellishments. 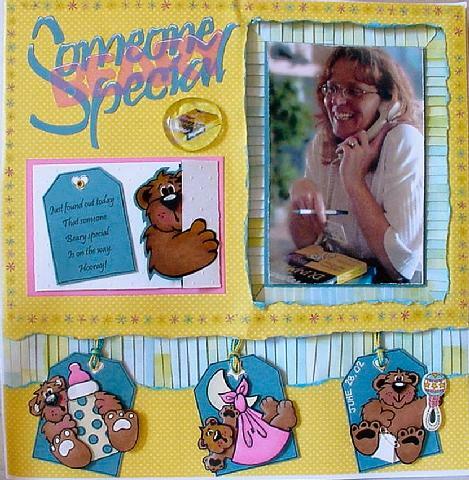 Well, the darn bears turned out so cut that I made another one and placed him on the journal card, which opens to reveal the journaling. I've been adding a "signature" to my layouts recently. I'm taking an element in the photo and "repeating" it somewhere in the layout. This time I took the "Pregnancy For Dummies" book which we had purchased that morning and was laying on the counter in front of my daughter, reduced it down and printed a copy. I cropped the book to size and placed it under a clear glass "puddle". This one is bulky and already got this scrapbook off to a bad start . . . . there's nothing in this book that will lay flat! I LOVE IT!